Knowledge of enterprise business processes and their supporting information systems is helpful, but not mandatory. The Open Group Architecture Framework (TOGAF®) Version 9 is a detailed method and set of supporting resources for developing an enterprise architecture (EA). It provides an Architecture Development Method, Content Framework and Capability Framework that can be used as the basis for creating an organisation's EA. TOGAF® also provides a variety of tools, building blocks and resources that facilitate the process and enable the design and development of EA across the business, data, application and technology domains. GWEA is the Government Wide Enterprise Architecture framework. It is derived from TOGAF® and uses the TOGAF® Architecture Development Method for implementing enterprise architecture. Its primary purpose is to prescribe a minimum standard for the development of ICT plans and blueprints for government departments and agencies. Click here for the FAQ on the TOGAF® 9 Certification programme. GWEA is the Government Wide Enterprise Architecture framework. It is derived from TOGAF® and uses the TOGAF® Architecture Development Method for implementing Enterprise Architecture. Its primary purpose is to prescribe a minimum standard for the development of ICT plans and blueprints for government departments and agencies. This in turn ensures that government departments and agencies are aligned to the South African e-government objectives and principles while also ensuring that the ICT plans are fully aligned with the department/agency’s business plan. The GWEA framework provides a method as well as guidelines on how enterprise architecture should be documented and applied within government departments and agencies. This allows departments to make technology decisions based on a full understanding of the mandate of the department as well as the department’s strategic programmes and thereby supports service delivery to the citizens of the republic. In-house courses are available for groups of 5 or more delegates. Michael Payne is an IT professional who writes, speaks, lectures and consults on various IT-related topics. Currently, Michael works for Real IRM as a trainer and senior consultant. He presents various courses including TOGAF® 9 Level 1 & 2 training and the EA Bootcamp. 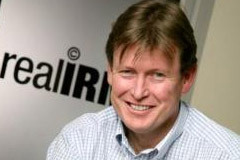 Stuart Macgregor is the Chief Executive of the South African company, Real IRM Solutions. Through his personal achievements, he has gained the reputation of an Enterprise Architecture and IT Governance specialist, both in South Africa and internationally.